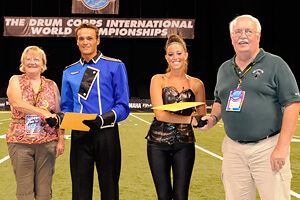 From several organizations including Drum Corps International, more than $14,000 in scholarships were awarded to corps members during the 2011 DCI World Championships in Indianapolis. The Jim Jones Leadership award, named after the late longtime corps director of the Troopers, is given out annually to World and Open Class drum majors who exhibit unparalleled leadership qualities. The 2011 Open Class recipient is DaJuan Brooks of Blue Devils B. A California native, Brooks is an instrumental music education and performance major at the University of Arizona. He was given the Jones award following the Open Class World Championship Finals in Michigan City, Ind. on Tuesday, Aug. 9. Brooks, who is a clarinetist in a number of University of Arizona ensembles, also was recognized World Championships week as the Individual & Ensemble Competition clarinet champion, playing his way to a gold medal with a perfect score of 100 points. 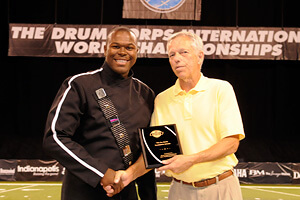 2011 is the second year in a row that a Blue Devils B drum major has earned the Jim Jones recognition. In 2010, former BDB drum major Eddie Pineda received the award. The World Class Jim Jones award went to Ben Pouncey of the Cadets. The corps' World Championship win in 2011 was the University of South Carolina music education major's third year on the drum major podium. Ben Pouncey with Gene Monterastelli. "It is unbelievable and very unexpected. I'm really speechless with everything that's happened tonight," Pouncey said about the Jim Jones award just moments after his corps had also won its 10th DCI World Championship title on Saturday, Aug. 13. "It's an absolute honor, and it's been a privilege to be part of the Cadets these last three years as drum major." Pouncey is the third Cadets drum major in 15 years to win the Jim Jones Leadership Award. Several additional scholarships were awarded as part of festivities following the World Championship Semifinals competition on Friday, Aug. 12 at Lucas Oil Stadium. The Dutch in DCI Foundation was founded in 1996 to support talented young performers from the Netherlands in their quest to march in DCI drum corps. Each year, the organization awards several $1,000 scholarships to help deserving members offset the cost of traveling overseas to participate in a corps. 2011 Dutch in DCI scholarships went to Erwin de Jong (Colts), Krijn Verstraatten (Blue Stars), and Marcel van Zanten (The Cadets). 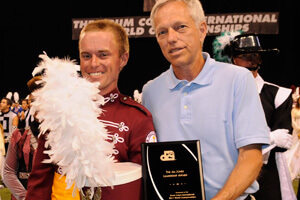 Stephen Grindel of the Boston Crusaders is the recipient of the 2011 Jim Ott Scholarship. The $3,000 award is presented annually by the California non-profit organization Sponsors of Musical Enrichment. Grindel has been a member of the Boston Crusaders for two years and attends Northwestern University where he is in the jazz studies program. Friends of DCI members Karin and Wayne Karge. The Friends of DCI Scholarship provides educational funding – no matter a student's major – to corps members to aid in their return to the classroom after a summer participating in the Drum Corps International Tour. After an application process that required answering essay questions and providing letters of recommendation, a panel of Friends of DCI members determined Michael Courey of the Bluecoats and Carrie Van Doren of Carolina Crown are the 2011 recipients of the award. Both from the Midwest, Courey is music major at the University of Akron in Ohio, while Van Doren studies musical theatre at the University of Indiana in Bloomington. Each of these corps members will receive a $2,000 scholarship. Also as part of the Friends of DCI program, the Richardson's Scholarship provides educational funding to corps members who study music education in the off-season. The two Richardson's award winners for 2011 were Patrick Furlo of the Cavaliers and Chase Tonar of Pioneer. Furlo, a student at Michigan State University is actively involved with the Spartan Marching Band as well as Tau Beta Sigma, the co-ed national honorary band service sorority. Tonar attends Carthage College in Kenosha, Wis., where he is a member of the university's choir and wind orchestra, among other ensembles.